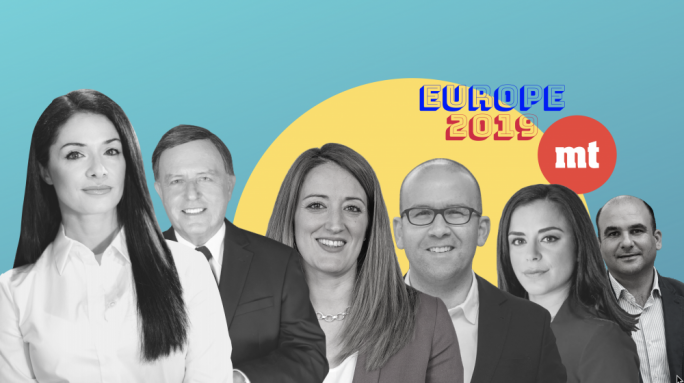 MaltaToday’s latest survey, carried out in a tumultuous political week, still shows the PL leading by four points as was the case last month in March, but the survey also shows Joseph Muscat losing three points in his trust rating as the Opposition leader gained a point. 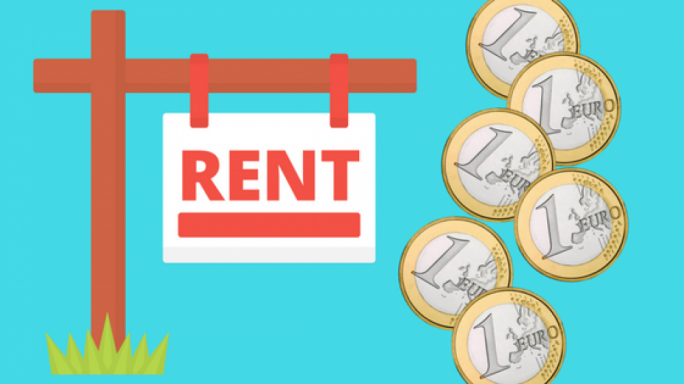 The survey, in which 650 respondents were contacted by telephone and accepted to participate, was carried out between Tuesday, 25 April and Friday. At 3.5 points, the trust gap between the two leaders is the narrowest registered in MaltaToday’s surveys since the 2013 general election. Moreover at 37.5%, Muscat’s trust rating is slightly higher than that registered in March 2016 just after the Panama Papers scandal hit the country. This suggests that allegations of corruption against the PM’s chief of staff, Keith Schembri, and claims of personal involvement in Egrant have dented the PM’s trust rating. Although still within the survey’s margin of error the four-point difference between the two parties has been consistent in the past three MaltaToday surveys and is slightly higher than a year ago. In an indication that a category of voters are reserving their judgment, the survey also shows a three-point increase in respondents who were undecided on who they trust most. The survey also shows Opposition leader Simon Busuttil enjoying his best trust rating since April 2016. As regards voting intentions, the survey shows the PN increasing its support by two points and Labour by 1.6 points. The survey also shows the PD, which has now joined a formal coalition with the PN, at 0.8 points. 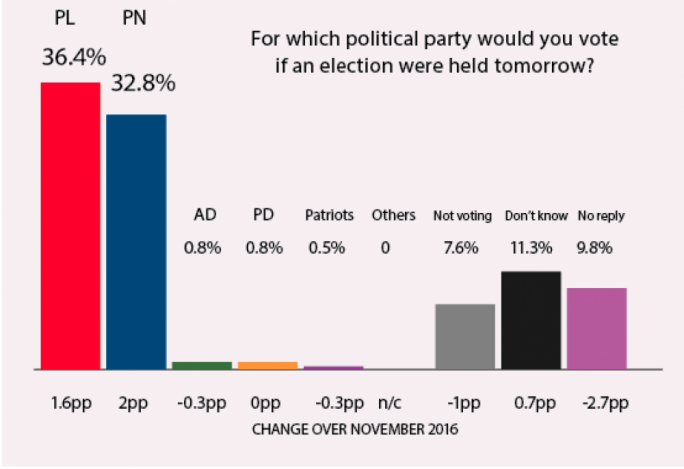 If the two parties retain the same combined support in an election, the gap between the PN-PD coalition and PL would drop to just 2.7 points. The Greens, who are also engaged in coalition talks with the PN but have so far refused the offer to contest on the PN banner, also register 0.8 points. The survey shows the PL leading by 3.6 points, down by half a point from last month. The difference is within the +/- 3.8 point margin of error which means that both parties may be in the lead. An extrapolation of the survey after eliminating ‘don’t knows’ and non-voters would put the PL at 51.1% and the PN at 46%, a gap of 5.1 points, which would go down to four points when the PD is combined to the PN. But the survey confirms inroads made by the PN among Labour voters in the last election. While 8% of PL voters in 2013 will now vote PN, 4% of PN voters in 2013 will now vote Labour. This suggests that while the PN benefits from a swing in its favour, the PL still manages to win over a substantial number of voters from the PN’s restricted 2013 core vote. Moreover Labour manages to retain 44% of switchers who voted Labour in 2013 but PN in 2008, while the PN recovers 28% of its support. But a substantial percentage of switchers (28%) remain up for grabs. The survey also confirms the existence of a new category of switchers, those who have voted Labour in 2008 and who have now switched to the PN. These amount to 3% of PL voters in the 2008 general election. 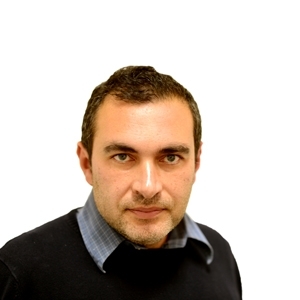 The same amount also trusts Busuttil more than Muscat. 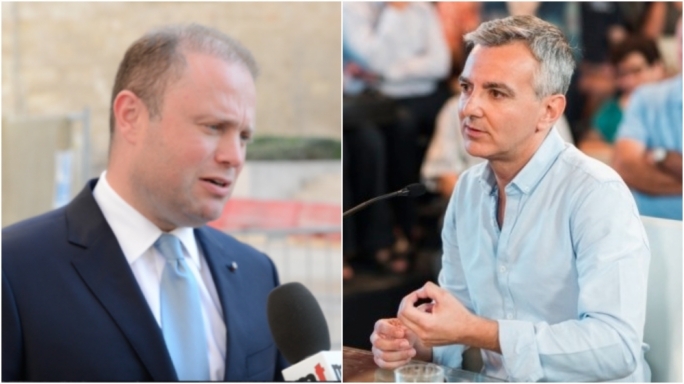 While in the last survey carried out in March, Muscat was five points more popular than his party, in this survey he is, like Busuttil, only one point more popular than his party. This indicates that Labour no longer has the comfort of having more space for future growth among that category of electors who prefer Muscat to Busuttil, but who are not committed with regard to voting intentions. It stands to be seen whether Muscat’s fall from grace is a temporary snag or a sign of future decline for his party. One positive indication for Labour is that while 39% of switchers trust Muscat, 44% of this strategic category will be voting Labour again. This suggests that some voters may have lost their trust in Muscat but are still willing to vote for the PL. On the other hand Busuttil still registers the same level of support as his party among switchers. Compared to last month, Busuttil has consolidated his position among PN voters in 2013 to the extent that the percentage of these voters who trust him has gone up from 82% to 85% in the past month. On the other hand Muscat has seen the percentage of those who trust him among Labour voters decline from 78% to 74%. Among switchers the percentage of those who trust Muscat has dropped from 48% to 39% while Busuttil has seen his trust rating in this category increase from 25% to 28%. The survey confirms that despite the recent scandals Muscat is still trusted by 5% of PN voters in 2013. But in an indication that Busuttil has struck a chord with a category of traditional PL voters, 4% of PL voters in 2008 trust Busuttil more than Muscat. The survey shows that while only 2% of PN voters in 2013 are intent on not voting, the percentage grows to 6% among PL voters in the same election. The percentage of non-voters has dropped by two points among past PN voters and by one point among past PL voters over last month. Moreover the survey shows 5% of PL voters in 2008 now intent on not voting. Indecision is also higher among Labour voters in 2013. The percentage of undecided PL voters drops to 5% among those who voted PL in 2008. While 9% of PL voters are undecided, only 5% of PN voters are in the same position. Switchers who voted PL in 2013 but PN in 2008 are the most undecided. A fifth of these voters are presently still making up their mind. Both parties lose a point to third parties. Significantly, the percentage of undecided Labour voters has grown from 7% last month to 9% now. Among switchers the percentage of undecided has increased from 14% to 21%. The survey was held between Tuesday 25 and Friday, 28 April. The results were weighed to reflect the age and gender balance of the population. The survey was stopped when a quota sample of 650 completed questionnaires. The survey has a margin of error of +/-3.8 points.